Internships at el Centro - 2015 from Matt Prochnow on Vimeo. ﻿Please excuse the poor sound quality in this video. Big Picture students all over the world cite their mentors as one of the biggest supporters in their lives-- not just in school. 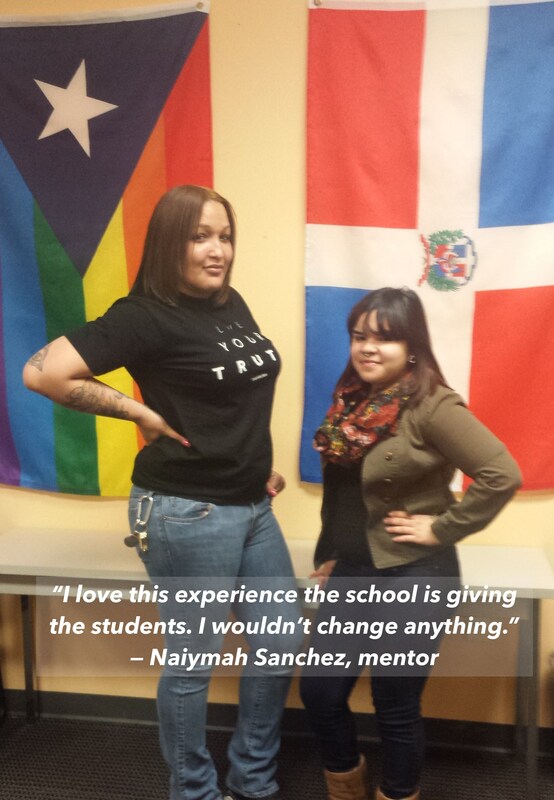 We would love to talk to you about becoming a mentor at El Centro de Estudiantes or Vaux Big Picture High School. Both of these Big Picture Philadelphia schools are committed to equipping and empowering our students to contribute to society in real ways, but we couldn't do that without the contributions of our community mentors. If you want to become a mentor at el Centro, please contact Nina Bilynsky. If you want to mentor a student at Vaux, or if you're not sure, please contact Matt Prochnow. What is mentorship? Mentors cultivate a relationship with a young person who shares their interests. Mentors meet regularly with their student-intern (and their advisor), attend exhibitions, co-develop projects, and share resources and other skills. Who can and should mentor a student-intern? Mentors are professionals who want to share their expertise and joy for their line of work. When do mentors host student-interns? Internships at BPP are scheduled during the school day because they are an essential part of the student’s learning experience. Students attend their internships Tuesdays and Thursdays. In general, an internship lasts at least three months, although good internships may last until the end of the school year and beyond. Why become a mentor? Mentors from across the Big Picture Learning network express profound personal and professional fulfillment through their work with interns, but the potential for mentorship goes further. Mentors have an opportunity to grow their own employee base by training tomorrow’s workforce, and to create new consumers by offering youth exposure to new experiences and industries. So although mentoring a student-intern from BPP allows adults like you to make a positive impact on the life of a youth, mentorship also lays a foundation for growth in your organization. How does BPP support mentors? Each student-intern has an advisor (a certified classroom teacher) who serves as an academic and social-emotional guide throughout the student’s tenure at BPP. The advisor is the mentor’s “point person,” too, and will contact the mentor every internship day and visit every other week. Advisors support mentors in understanding their student-intern’s learning style, in developing project work, and in student-intern accountability. Advisors are also troubleshooters, and can help brainstorm solutions to any problem that arises, including how to challenge and engage an intern on a daily basis. A note on safety: Students are insured through the school! We carry accident and liability insurance, and require that mentors take potential interns on a walkthrough of the worksite at the outset of an internship. We also arrange for all mentors to get a Childline clearance and a state background check.